THE Manila Mobile Theater Foundation (also known as Tanghalang Sta. Ana) stages a pre-Lenten production entitled Martir sa Golgota, a senakulo play based on the life and passion of Jesus Christ on March 22, 2013 at 7:30pm and March 23, 2013 at 3:00pm at the Cultural Center of the Philippines’ Tanghalang Aurelio Tolentino (Little Theater). 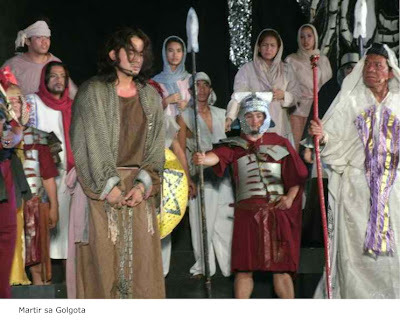 Directed by Lou Veloso, Martir sa Golgota features around 70 actors, mostly volunteer residents of Sta. Ana and invited TV, movie and stage personalities like Jojo Riguera and Al Gatmaitan (alternating as Jesus Christ), Bodjie Pascua, Archie Adamos, Don Umali, Ces Aldaba, Troy de Guzman, Perry Escano, Andy Bais and Rita de Guzman, among other performers. Other performers include CJ Mangahis, Abel Napuran, Richard Manabat, Jojo Bolado, Arkin Da Silva, Haydee Arima, Mira Hipolito, Jenny Navarro, Roxanne Hipolito, Apple Garay, Norbi Lilagan, Jan Michael Sarabia, Jennet Quiblatin, Kristine Gabriel, Darius Nicolas, Rafael Hipolito, Ryan Jay Rafael, Mark Tulipat, John Paul Razon, Rodolfo Muyuela and Miguel Lara. Manila Mobile Theater was born in September 1989. It was founded by Councilor Lou Veloso, who himself is an accomplished and multi-awarded film-television-stage actor. The group initially had 75 active members and was primarily organized to help the out-of-school youths, students, professionals, laborers, vendors and workers hone their talents in acting on stage plays, be it one-act or full-length. After acquiring the necessary skills, they became part of various plays which were mostly mounted in Plaza Hugo community stage and, later on, in Sta. Ana Arts Center, a small indoor theater located at the backroom of the side stage built through the initiative of the founder with assistance from the Manila Government officials and other donors. Martir sa Golgota is presented to the public in selected venues from Holy Monday to Black Saturday with actors honed at a home base from the community. Throughout the years, it has attracted celebrities and theater actors who perform pro bono. An interesting aspect of Martir is its contemporary improvisational factor. The road to Calvary is convoyed on the streets of the community giving the audience a close up on Christ’s passion. Tanghalang Sta. Ana remolded this theater classic for contemporary audiences by injecting current social issues. Ticket price is P400 with discounts. For details, contact the CCP Performing Arts Division at (632) 832-1125 loc. 1606-1607. For inquiries and other details please call (632) 527-5221 or 527-1685.